What is the single most expensive piece on most APHs? The answer will usually be, the check-valves. 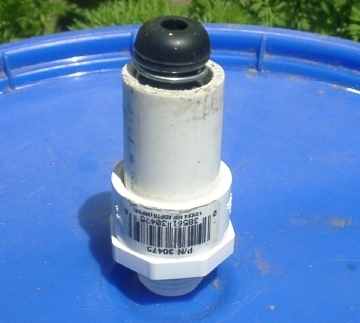 These simple devices run at prices around $10 each and since APHs will often require two of these, almost half the money spend on a homemade might end up going into its check-valves. In an effort to make homemade soakers more affordable in general, I have designed a very simple but effective check-valve, that can be built at home for the amazingly low cost of $3.60 each and takes only five easy steps to build. These instruction will show you exactly how to build a 1/2-inch check-valve. You can vary the sizes of material for different diameter pipes. A 2-inch long section of 3/4-inch PVC. 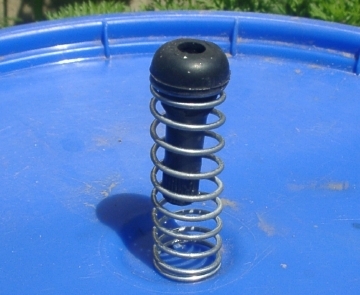 A 3/4 x 2-3/16 x .062 compression spring. I got those numbers off the box of springs. The first two indicate width and length of the spring in inches. The last number is how thick the metal is. These numbers should allow you to find the exact spring, but if you cant, just try to find a compression spring that fits well into a 3/4-inch pipe and is not too long. 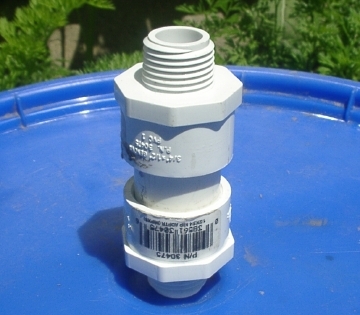 A 1 1/4-inch "CampBell Hausfeld" bike-tire valve. These are easily identifiable by a cone-shaped rubber gasket. The rubber is the part you really need here. If you can find another cone-shaped piece of rubber however, it may work just as well, but these seem to be perfect for my purposes. And two, 3/4-Inch female-smooth to 1/2-inch male-threaded couplers. 1: Following the instructions on the can, PVC Cement one of the couplers onto an end of the PVC pipe. Let this dry. 2: Insert the neck of the tire-valve into one of the ends of the spring. 3: Slide this tire-valve and spring assembly down the pipe. The end of the spring should protrude about a half inch out of the PVC. 4: Glue the second coupler onto the other end of the PVC to close it up. Remember hold the coupler pressed onto the PVC pipe with your hands for about 30 seconds, so that they do not pop apart. You have now built a fully functioning check-valve in only a few minutes and saved about $6.40 on your next project requiring one of these. I have not actually used these in a homemade yet, but I did run some pressure tests and found that they worked beautifully.